The University of Northern Iowa provides an ideal setting for graduate study and offers master of music degrees in wind conducting and music education as well as a master of arts degree with a conducting performance emphasis. The size of our graduate program allows our students to have an individualized experience of the highest quality. This experience includes in-depth podium time, individual lessons with our conducting faculty, performance experiences at the highest levels of professionalism, and daily collaboration with talented student and faculty artists. 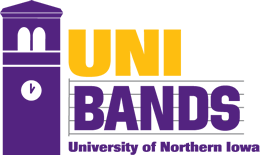 Graduate Assistantships with UNI Bands offer an additional level of experience that involves instructional and administrative responsibilities with both the athletic and wind bands. Band Graduate Assistants receive a full tuition package as well as a stipend. Students who wish to major in conducting, music education or master of arts degree program are eligible. Applicants for our Graduate Assistantships should schedule an on-campus interview with our Band Staff by contacting Danny Galyen, Director of Bands.